Noctua, practically an undisputed leader in air cooling, announced its new NH-U12A heatsink, the 5th Generation of its award-winning U12 series that opened with great success back in 2005 and where the four generations has been launched accumulated more than 600 awards distributed throughout the world. 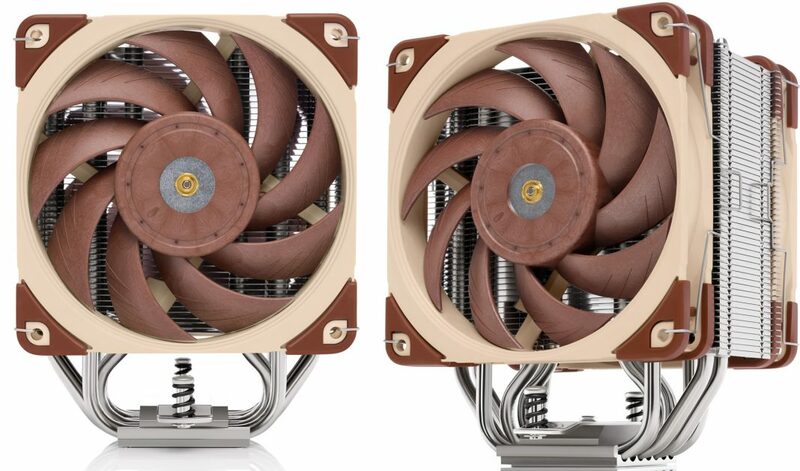 The Noctua NH-U12A dimensions are 125 x 58 x 158 mm in height where its radiator of aluminum is crossed by no less than seven heatpipes of copper of 6 mm thickness attached to a generous copper base that ends up absorbing the heat generated by the processor. On both sides of the radiator you can mout two fans for push and pull configurations (2x NF-A12x25 PWM 120mm fan included with package). Each fan has SSO2 bearings and is capable of rotating between 450 and 2000 RPM generating a maximum air flow of up to 60 CFM with a maximum loudness of 22.6 dBA and a lifetime of no less than 150,000 hours of use before present any kind of problem. The information of the Noctua NH-U12A is completed with the reliable SecuFirm2 mounting system compatible with Intel LGA115X, LGA20XX and AMD AM4, AM3 (+), AM2 (+), FM2 (+) and FM1 CPUs, the heatsink is accompanied by the composite Noctua NT-H1 thermal, two LNA adapters (adapter to reduce noise by turning the fans up to 1700 RPM), and all this is supported by no less than 6 year warranty to confirm the superior quality of Noctua products. Unfortunately, not everything could be perfect, it goes on sale for no less than 99.90 euros / USD. For more information, visit the Noctua product page.